A key goal of the CRUK Cambridge Centre is to connect all the diverse research strands and organisations to form an active cancer science community in the Cambridge region in order to stimulate new research possibilities. If you are located in the Cambridge area and your research is cancer-related please contact us to find out more about joining the CRUK Cambridge Centre. All members of the CRUK Cambridge Centre are located within the Cambridge area and involved with cancer-related research. Members are required to support the following guiding principles of the CRUK Cambridge Centre. The CRUK Cambridge Centre supports and encourages scientific collaborations across diverse disciplines. 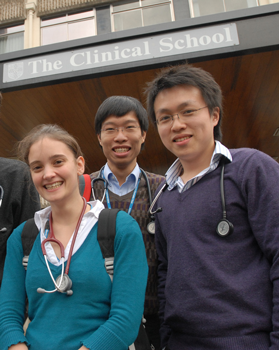 PhD Studentships – 2 clinical and 3–4 non-clinical PhD studentships are funded by the Centre each year and are open for applications from members. Mentoring and advice – Members are also encouraged to support the training and development of clinical and non-clinical staff through informal mentoring and advice. Laboratory equipment and facilities – Members are requested to share information about their specialised laboratory facilities with the aim of sharing access where spare capacity is identified, and jointly procuring new equipment and facilities. Tissue Bank – Members are asked to contribute to and facilitate the provision of samples for Addenbrooke’s Tissue Bank. CRUK Cambridge Centre brand – Members are obliged to acknowledge the Cancer Research UK Cambridge Centre brand in their research activity and publications. CRUK Cambridge Centre website – Members are required to create, and keep up to date, their profile page on this website. Members will acknowledge their participation in the Centre on their partner organisation website and link to the CRUK Cambridge Centre website. Public engagement – Members are encouraged to support events and activities to raise awareness of the CRUK Cambridge Centre, as well as cancer research and clinical innovations in Cambridge. 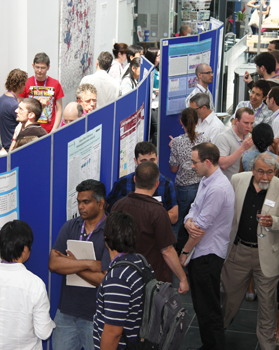 A number of meetings and networking events, including the Symposium, Postdoc workshops and Technology Exchange workshops, are provided free of charge for Members. If Members are organising their own meetings, the CRUK Cambridge Institute Lecture Theatre may be booked for large cancer-related events at no charge to Members. Pump-priming funds – Members can apply for pump-priming funds to support new collaborative projects across disciplines.